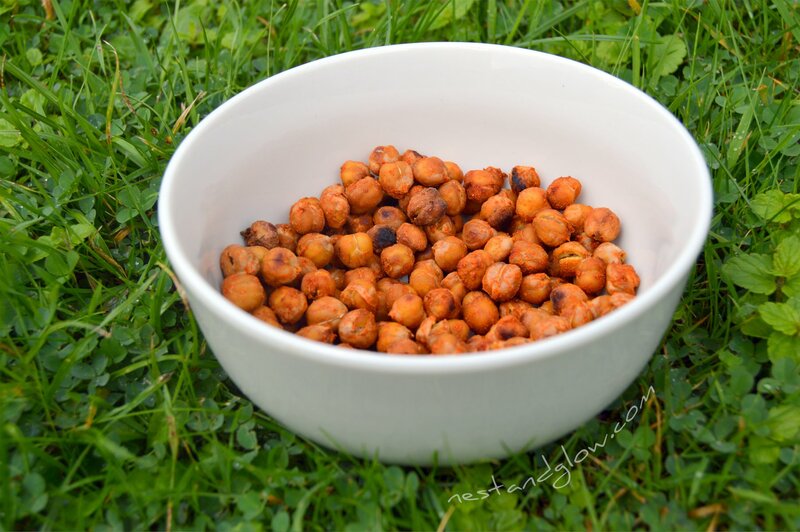 These Smokey Roast Chilli Chickpeas are the perfect healthy alternative to crisps with a crispy texture and full of flavour. They are seasoned with smoked paprika to give the smokey taste and cayenne pepper for a chilli kick. No oil is needed for these, they are dry roasted so are infinitely healthier than crisps. Full of protein, low in fat, easy to make so what’s not to love with this snack? I love these chickpeas as a late night snack. They are high in fibre to keep you filled for a long time. I can’t sleep if I’m hungry and a snack like this late in the evening settles well in my belly, unlike crisps that contain little nutrition and loads of unhealthy oils. It hardly a recipe as all it takes is mixing the seasoning and putting in the oven, but so many people that have asked how to make Roast Chilli Chickpeas I thought it deserved a write-up. You don’t even need to use a bowl for mixing in the seasoning, just use the baking tray and save on the dirty dishes. It may take half an hour in total, but it only takes 1 min prep time as the oven is doing all the work. These roast chickpeas are beautifully crisp. There are a few dark patches but they are not burnt and roasted to this colour gives a great char-grilled taste without any bitterness. I created this meme to encourage more plant based foods. The average diet is lacking in fibre so chickpeas are a great food to have for protein. The amount of protein I admit is a bit misleading as I’m using the cooked weight of chickpeas in this recipe when they are dry. But we do need far less protein than we.ve been lead to believe. Nest and Glow Recipes is all about enu=coraging more plant based foods, its good for your wallet, health and environment so why not try having more chickpeas? Chickpeas come from the Mediterranean and the middle east regions. They have been shown to help with diabetes, IBS, bone health, blood pressure, heart conditions, inflammation and weight loss. Drain and rinse the chick peas and lay out on a non stick tray. I use some grease-proof paper to save on washing up. Mix in the smoked paprika, onion powder, cayenne pepper and sea salt directly on the tray. Put in an oven at 400°F / 200°C for about 30-35 mins. Remove from the oven when they are golden. If you want them crispy they will need closer to 35 mins, but you will need to keep an eye on them as they can go from very crispy burnt in a matter of minutes.